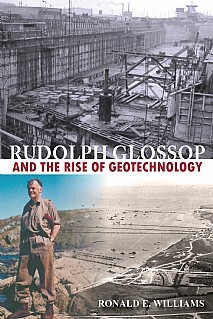 Rudolph Glossop made a unique contribution to the early development of both geotechnical engineering and engineering geology and this volume presents a fascinating and revealing perspective on his involvement by means of selected extracts from personal diaries, letters and journals. From his early experience as an undergraduate and the four years spent in the Gold Coast to the establishment of Soil Mechanics Ltd and his time as director of Mowlems, Glossop became one of the key figures and was involved in many of the key stages in the development of geotechnology. His journal provides a fuller understanding of the Mulberry Harbour, which was a key factor in the success of the D-Day landings in northern France, June 1944; while his diaries give a unique account of the significant challenges that had to be overcome during construction of Derwent Dam, N.E. England. Ron Williams has painstakingly pieced together a fascinating account of the life and career of an outstanding engineer, and in the process has painted a vivid portrait of Rudolph Glossop and his achievements. Not before time will today’s engineers and scientists have the opportunity to appreciate the achievements of one of the key figures in geotechnical engineering. This absorbing book will be of paramount interest to professionals in engineering geology, geotechnical engineering and all those interested in their history.